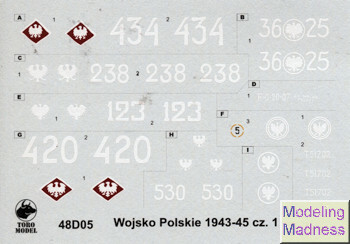 The other day, I was looking around for a set of decals to use on a T-34 mod 1941 tank. 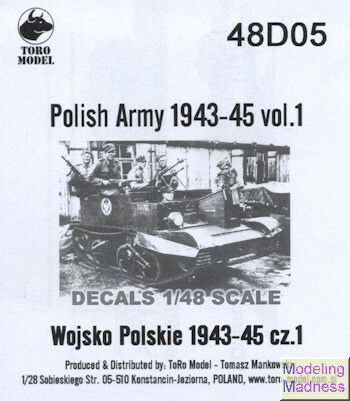 One place I checked listed several sheets for the Polish Army in WWII and I contacted the shop in Poland asking if any had markings for the mod 1941 T-34 so I could use it on a Tamiya kit. He replied with this sheet and so I ordered it. The total cost in USD for getting the sheet was under $8.00 and it includes a number of interesting subjects. As armored vehicles usually don't carry much in the way of lavish markings, it is not surprising that there would be a number of markings on what is a relatively small sheet. Included are two of the requisite T-34/76 mod 1941s, a Jeep, a Universal Carrier, a T-34/85 mod 1944, two IS-2ms and a pair of BA-64 armored car. I'm pretty sure that most of the vehicles contained on the sheet are part of Tamiya's extensive 1/48 line. The T-34/85 is available from Hobby Boss. The decals are nicely printed and the web site for the sheet offers color profiles which could well come in handy, though much of this stuff will be Soviet green, British green or US olive drab. In any case, things like this offer a nice option to the usual Soviet marked vehicles and I'm glad to have located the sheet.